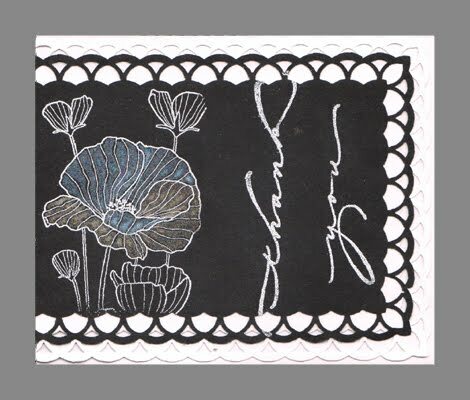 I punched the border of my main white card and then a smaller black version using Martha Stewart "Layered Arches" Punch Around the Page set. Stamped the flowers with a Perfect Medium pad and embossed with white, then colored between the lines with a Quickie Glue Pen and Ritz Micro Fine Glitter (Warm & Cool highlights). The cool on black gives a bluish tinge and the warm gives a golden tinge. I then stamped the Thank You (Quietfire Design), leaving more space between the words, with Brilliance Moonlight White and embossed with the white. Done - clean and simple. What a fabulous card - I just love the black and white combination. Thanks for playing along with us this week at Pixie Dust challenge. That's a beautiful border punch! It really pairs beautifully with the image! This is so pretty. I love the way you stamped your flowers. Great job. Thanks for joining us at Flourishes. Hope to see you Thursday night at the release party on Splitcoaststampers. Your poppies look absolutely gossamer! Nice effect! Pretty punched border, too. Glad you could play in the Cut Above challenge! Oh great image, nicely done. Thanks for playing in Flourishes A cut above the rest challenge. Lovely card, very elegant! Great to see your work at Polka Doodles Challenge! Thanks for joining us and good luck! Beautiful and unique card! Thank you for "Keeping it Simple and playing with us at Paper Sundaes this week! 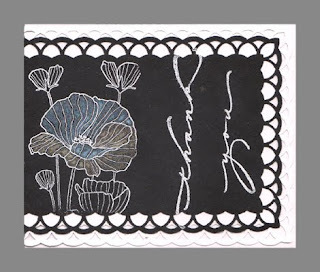 Such a pretty card - I like the poppy being stamped in white. A really lovely card. Love the coloured highlights on the poppy. Thanks for joining in with my Polka Doodles colour challenge and hope to see you again. Beautiful and so striking! Thanks for entering the Polkadoodle Challenge - hope you can join us again next week!